Last weekend I stepped up to a starting line for the first time in a long time. My last race was the women's half in SF, my last 10k was in AMS and I ended up on top of the podium. If this race report was focused on performance and pace and speed and results, this would not be a very happy race report. I have lost a solid 6 MINUTES from my last 10k race pace. Ugh. That is humbling and annoying and feels yuck. But luckily, I am the writer of this post and this post is not that kind of race report. 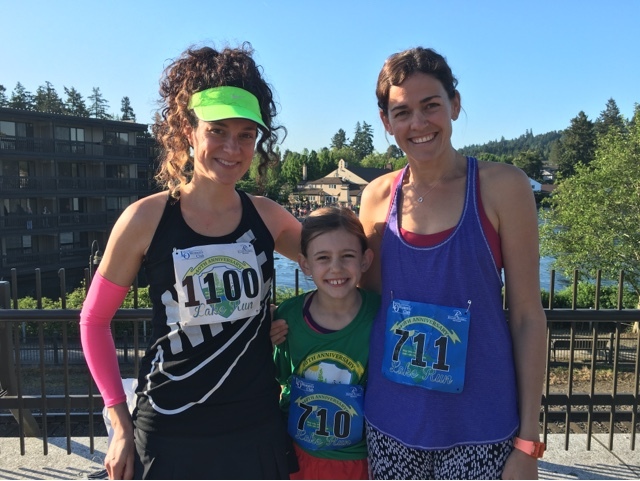 This post is about how awesome it felt to be back on the PDX running circuit with my PDX running partner and sweet sweet 8 year old SC! SC (and her momma) rocked the 5k! It was so fun to be there with them. I'm a midwest farmer's daughter who fell in love with a French ski racer from California. Recently, we jumped at the chance to move to Amsterdam for nearly three years. More recently, we returned home - to Portland, OR. We have a little boy and a little girl. Neither is too little anymore. I like happy colors and vacations. My college degree claims I am a Mechanical Engineer, although my heart tells me I am an artist. I'm also a runner. I love the word garden as a noun but not as a verb. Thanks for stopping by. This perfect purple house on the water makes me want a perfect purple house on the water.